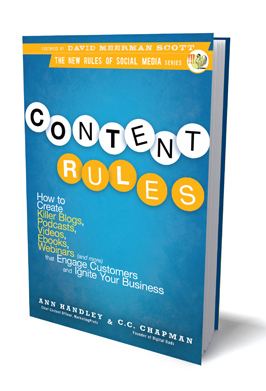 It took me far too long to get to it, but I finally read “Content Rules“. The book, written by Ann Handley and C.C. Chapman, absolutely rocks. Thanks to the style of their writing and the quality of their advice, there is momentum throughout the pages that makes this book tough to put down. In fact, I will admit this — while reading it on a recent Saturday night, I felt a nearly overwhelming urge to get to the office and implement a few of the things that I was learning. Their tone is friendly (heck, I only used their First Names in the title of this post :-)), but their points are firm and clear — to stand out from your competition and to truly engage prospects and customers, you must have compelling content. Here is another thing that I loved — their advice truly hits home, no matter what your situation is today. For example, they profiled companies that might have marketing budgets exceeding yours by tens of millions of dollars. However, the “Ideas You Can Steal” paragraphs at the end of each case study can be easily applied by businesses of any size. Focus on your audience! What can you share that will help them today? These were just a few of the points that ended up in the Notes application of my iPhone while I was reading. I’m proud to say that I’ve already made some changes in interlinkONE‘s marketing efforts based on what I learned from this book (and there’s still more on my to-do list!). Thank you to Ann and C.C. for being so generous with your knowledge. I owe you, big-time! Great thoughts. I listened to the authors of “Content Rules” being interviewed on Duct Tape Marketing’s podcast and thought they had some really great points. This book is on my reading list (too bad its very long right now). I look forward to getting my copy. Tim, thank you very much for the comment, and for posting a link to your article. It was excellent. Here was one of my favorite lines: “Decide now what you want written about your life”. Thank you for the motivation! Well hot damn, you made my morning! I love that you loved the book so much and you highlighted some of our favorite things. We tried to really balance out our examples so anyone could leave the book with ideas that they could actually start using and our “Ideas You Can Steal” was set up exactly for the reasons you enjoyed them. I honestly will say that I am honored that you checked out this post and left a comment. And the fact that you enjoyed my review just absolutely made my Friday. Thanks again for all of the knowledge that you share. I greatly appreciate it.